10 April 2019: It takes a village. And for children with cerebral palsy, it’s important that committed physiotherapists and occupational therapists are part of that village. That understanding underlies the Gabby Robberds Scholarship for University of Canberra students – it’s about supporting the next generation of therapists who play pivotal roles in the lives of the disabled. “Physiotherapy and occupational therapy both have a huge impact on kids with cerebral palsy, and can improve their quality of life so much,” said Craig Robberds, Gabby’s father and a University alumnus himself. No one knows better than the family of someone with a disability, how consistently understaffed these fields are. So Mr Robberds and his family created the scholarship in 2012, as an homage and meaningful legacy after Gabby passed away in 2010. Read more of Gabby’s story here. 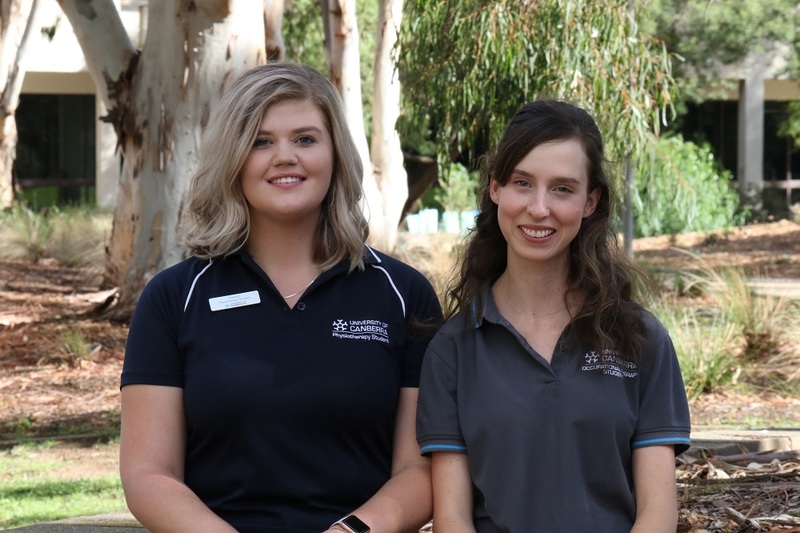 This year, scholarship winners Harriet Drane (Bachelor of Physiotherapy) and Rachael Mitterfellner (Master of Occupational Therapy) impressed the selection committee as much with their empathy and enthusiasm for working with children with disabilities, as with their academic prowess. They each received $1,500 and a practical placement with the Cerebral Palsy Alliance (CPA), as part of the scholarship. “This is a fantastic opportunity for us to engage with students who are enthusiastic, eager and at the start of their careers,” said Shilo Preston-Stanley, CPA ACT Services Manager, who actually worked with Gabby herself. One of the most important aspects of working in physiotherapy and occupational therapy is the ability to work in a person-centric, family-focused way. Thomas Bevitt, Occupational Therapy Professional Practice Convener and Lecturer at the University said that the placements will provide the opportunity to turn knowledge into practice and work-ready skills. For 2018 Gabby Robberds Scholarship winner Kinza Newman, the placement cemented her desire to work with the CPA; she started in a permanent role there in March. “I’ve seen how therapy helps children who are struggling, how much it helps them catch up developmentally, and grow in confidence when they realise that their disability doesn’t define them,” she said. Professor Geoff Crisp, the University of Canberra’s Deputy Vice-Chancellor & Vice-President Academic said that there were many ways to honour Gabby’s memory, and that choosing to support disability education this way was both remarkable and meaningful. “Gabby obviously made a huge difference in your life, and you are extending that difference to so many people by supporting and educating young children,” he said, addressing the Robberds family at the scholarship presentation ceremony. Ms Mitterfellner and Ms Drane both have very personal connections to their chosen vocations. Ms Mitterfellner completed a Bachelor of Medical Science before she embarked on a Master of Occupational Therapy – but the seeds of her vocation were sown decades earlier. As such, she’s a big believer in the benefits of early intervention. She especially loves working with kids, and is looking forward to going into paediatrics upon graduation. For Ms Drane, it was music that led her to pursue a career in physiotherapy – and discover a passion for working with children. Switching her study field to physiotherapy, Ms Drane maintained her connection to music by becoming a singing teacher for kids. Ms Drane also has personal lived experience of disability, experiencing hearing loss that started when she was four and culminated in extensive rehabilitation, and cochlear implant surgery in the first year of her Physiotherapy degree. Such experiences have contributed significantly to her perspective on disability.